Let’s change companies’ aspirations (mission, vision and values) from static words to catalysts that can transform organizations into communities of passion! Three modern management principles were created: mission, vision and values. According to the most prominent scholars, whoever applied these principles could obtain the secret to provide alignment, purpose, vivid references for the future, and core foundations to run successful organizations. Pretty soon, practitioners from all corners of the corporate world introduced those principles into their organizations. Even though you certainly may find great examples of how company aspirations (mission, vision and values) have inspired communities and led them to a prosperity path, those cases seem to be more exceptions than the rule. Why is this so? Is it because company aspirations are outdated tools which simply don’t fit in this new century? Or is it because most organizations have simply failed to leverage them to their fullest potential? We like to think that the second option is the most likely explanation. Gee, I Need a Dictionary! In other cases, senior executives acknowledge the strategic importance company aspirations have and put real efforts in designing impressive mission, vision and values. The downside is that too often those superbly designed aspirations are quite complex to understand and recall, and in consequence, hardly shared by the entire community. Regardless the case, misapplication of company aspirations leaves the organization misaligned in general, and in extreme cases, truly rudderless. So, how to tackle this situation? 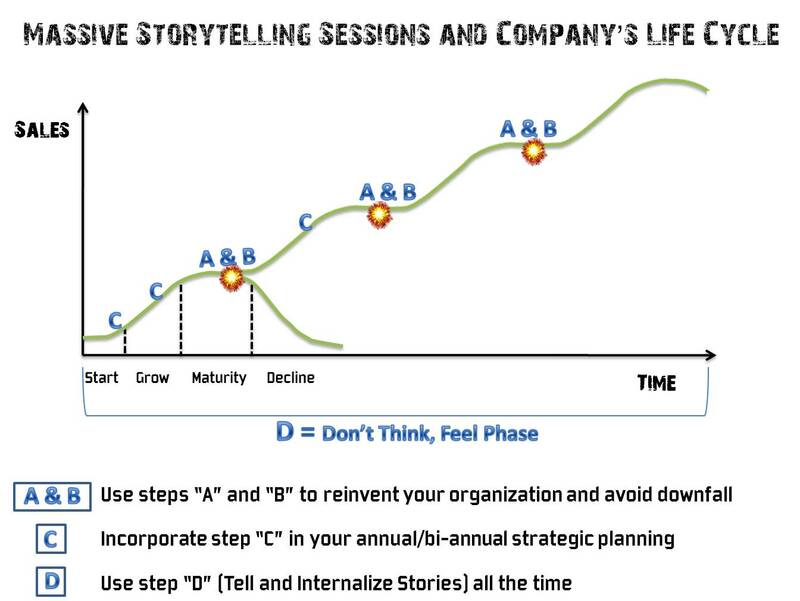 The solution comes from a courageous and selfless process to democratize organization’s strategy by running a series of Massive Storytelling Sessions. Through them, everyone will have the chance to speak up their mind, co-create an organization’s saga (by producing truly shared company aspirations and co-creating simple but compelling stories that illustrate these aspirations from myriad perspectives) and get rewards and recognition for their contributions. At the end of the storytelling sessions, the entire organization would be imbued with a flexible but highly disciplined, self-regulatory process. Hence, it will help in turning the organization into a creative, nimble and always engaging community of passion. However, before we move forward to the practical application of the sessions, it would be helpful to explore some main ideas to make this curious hack as palpable as possible. This hack is conceived to enhance company aspirations, that is, a company’s mission, vision and values. However, what do these three principles mean? 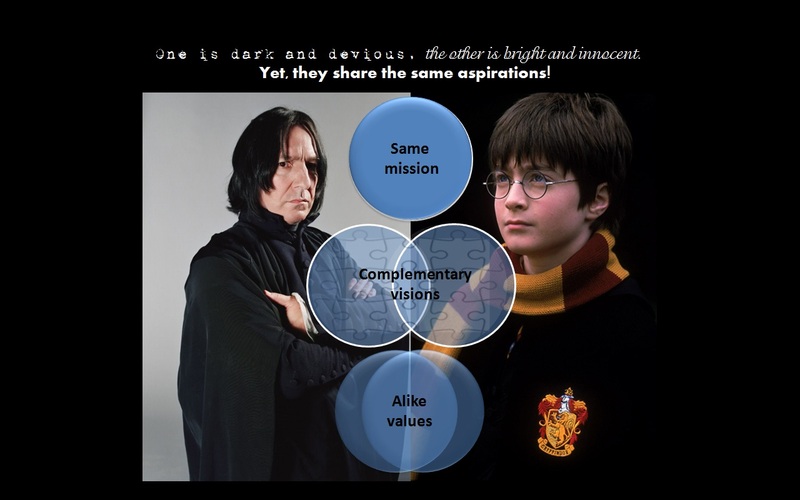 Is there a marked difference between mission and vision or can they be used as synonyms? Moreover, are values really useful? Let’s mix up management theory with some magic in order to solve the mystery. Here is Harry Potter’s mission: to defeat evil, personified in Voldemort. This is his raison d’être. He was meant to destroy you-know-who. He was the chosen one after all. A vision, unlike the mission, is not an abstract concept, but a practical tool. It is an evocative and vivid picture of the future an organization wants to draw. If the mission provides direction and persistence, the vision fills the organization with passion. Once again, how Mr. Potter’s vision would look like? We infer that it may be something like this: a harmonious and peaceful world, where muggles (humans) and wizards can coexist. That could be Harry’s dream. By creating such a place, it will also let him honor the memory of his beloved parents. Values are the fundamental ethical beliefs that rule your actions. In an organizational level, values are the backbone, which supports members’ decisions, especially in front of a crisis or uncertainty. Without values, your organization will crumble and your aspirations will never be fulfilled. If you are familiar with Harry’s story, it would be easy for you to spot his strongest values: love, friendship and bravery. Mr. Potter succeeded every single challenge because he stayed true to those principles along his entire journey. This hack invites you to come up with a single and driving set of company aspirations (one mission, one vision and a set of core values). Then, you should tell it from different angles in order to elicit a true passionate community sense. Radical fix warning: from time to time, the current set can be massively questioned to assure the organization still copes with current and future challenges. Now, in order to do so there is an aspect that would help in this process. As you may know, much has been said about our learning styles. Some of us are visual, some auditory and some tactile/kinesthetic learners; some like to read a book, some prefer to watch a movie and some want to do both. Therefore, wouldn’t it be fun and highly engaging to produce multiplatform versions of your company’s mission statement? What about a kinesthetic interpretation of your community’s vision? Such possibility seems rare and intriguing, but potentially captivating. Let’s take the Star Wars saga for instance. You have the original film and its sequels and prequels. Then, you find fan films (yes, inspired fans producing their own material), novels, video games, animated series, and the list goes on. Each one of these versions tell the same epic story from different points of view, thus, keeping the legend alive, even incorporating new generations who have not seen the original films to its fan base. By maximizing the potential of this hack, every organization member (including stakeholders) will be able to bring life into community’s aspirations according to their particular world views and personalities. Guaranteed, there will be moments where you will feel the train is getting out of hand. You may find yourself surrounded by stories with unexpected plots and weird spin-offs. It would be a tremendous management 2.0 challenge! Resist the urge of applying emergency brakes. Instead, buckle up; close your eyes and trust, even if you have among your ranks the very same Severus Snape, the wicked and dark Harry Potter’s professor. Vision: redemption for his past and honor to Lily’s -Harry’s mother- memory plus a contribution to a peaceful world. Values: loyalty, love (especially towards Lily) and bravery. Did you notice how similar are his aspirations to Harry’s? On one hand, their missions are exactly the same. On the other hand, although visions are a little bit different, they complement each other and produce even a more evocative image. Last but not least, values are pretty much the same, too. This is the power of having shared and deeply internalized aspirations. We will provide you with valuable insights in order to do so. As the business narrative theory advocates, you don’t need to write a +1000 pages Leo Tolstoy’s War and Peace to tell your company’s story. On the contrary, you will need to produce a portfolio of minimalist-fashioned stories with one or two protagonists and simple settings. Bible parables, for instance, are good examples of simple but compelling stories. We encourage you to look up some business narrative literature to enrich your knowledge in this area. We recommendThe Leader’s Guide to Storytelling by Steve Denning. 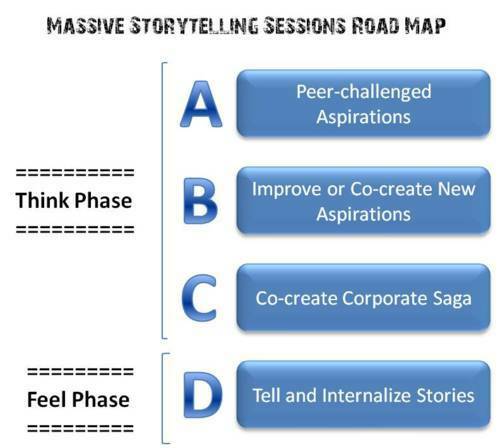 The Massive Storytelling Sessions should be open to every member of the organization. You may even consider inviting customers, suppliers and other stakeholders to participate. It is highly important to ensure that people will be committed to be part of the process rather than to be assigned or allocated as if they were mere resources. Participants can work in teams but with one limitation: up to five people in order to ensure each member’s contribution. Alternatively, it is also fine if someone decides to work on his/her own. Teams and single players are completely free to decide when, where, and for how long, they will run their sessions based on their personal commitment, but without neglecting their primary responsibilities to the community. All teams and single players’ contributions will be posted in an open and transparent Web contribution platform, similar to the one we have in our Management Innovation eXchange to post our hacks and stories. The first thing you—and your fellow organizations’ leaders—need to do is to let go of the control you hold and be vulnerable. You do not need to have all the answers! This is perhaps the most difficult and important thing you need to accomplish if you want to become a forward-thinking leader. The almighty leader era is over. Try to accept that you have to rely on others to achieve your objectives. Hence, you, as a leader of the future, will be more humble and less a hero. You will have to sacrifice yourself in order to let others succeed. You will have to detach yourself from your hierarchic power. We highly recommend you to readZen Flesh, Zen Bones by Paul Reps. It is a book full of Zen stories, which shows the door of the mysterious path of abandonment. Let’s face it, modern organizations are poised with counterincentives and skepticism. Therefore, to effectively sell this hack and ensure commitment, senior executives should initiate an authentic and sincere call for help to its community. In other words, leaders should make clear that status quo command and control methods must be replaced by truly collaborative ones. Also, they should emphasize that corporate strategy is everyone’s business. In this sense, the Massive Storytelling Sessions could be one of the first big steps to promote passion, creativity and innovation within the organization. Become a seeder: teams and single players can upload stories, thus, becoming seeders. Become a Peer: based on Ellen Weber’s hack, any organization member is free to support stories they believe are unique and valuable gems for contributing in the creation of the organization saga. In addition, instead of using the well-known one-to-five stars rating system, we invite you to use just a simple “peer this story” button or an “I Like this story” button. You can appreciate some of our first sketches of the platform here. Once initial settings have been carried out, you will be able to run the Massive Storytelling Sessions. At this point, you will probably have a rough beta version of your contribution platform and a considerably group of participants to start with. In this phase, everyone will have the chance to actively think about company aspirations. Participants of the sessions will be able to challenge their current set of aspirations, improve them or create brand new ones, and finally produce a portfolio of compelling stories in order to build a corporate saga. Please ensure that the storytelling sessions outcomes will be shared with the entire organization in order to promote an open and powerful conversation about the present and future of the company. Use your corporate intranet or your new collaboration platform to facilitate and encourage everyone’s contributions and involvement. Are the current aspirations what we really need for our community? Are they simple and clear to remember and most importantly to understand? This is what you need to evaluate with your storytelling sessions participants. Do you have a simple, engaging and driving mission statement that merits being told through compelling stories? To assess your current mission, you should start a collaborative and open discussion about what it is and means. You can use for example, these guideline questions to complete this task. On the other hand, we invite you to check out the impressive Red Hat’s experience about how after a collaborative effort, all its members came up with a new purpose, easy to identify with. Is it clear and engaging? Is it aligned with our mission? Does it provide passion to our mission? One important thing to evaluate prior telling values stories is the overlapping between organizational and personal values. This is a very critical part of the relationship between knowledge workers and the companies or organizations they work for. As Peter Drucker has said many times over, at the end of the day, if your values and those of the organization don’t match, it is time for you to find another organization. The truth is, one can’t fake values. You either have them or you don’t. Thus, it is a two-way street. Organizations must attract people with values similar to theirs and knowledge workers must find organizations whose values fit their own. What would happen if at the end of the evaluation of your core values you discover that most of your community members are not engaged with your current set of values? Does it mean that you will have to replace all your personnel? Not precisely. Most likely, your stated organizational values (values we think we have/follow) are not your de facto values (values we actually have/follow). Too often, management-derived values are the result of “checking-the-box” and not representing reality. Engaging the community to reveal what the organization’s true values are has the power to make them REAL! Ultimately, basing values on what is most true is more powerful and more effective for everyone. Did your current set of aspirations pass the challenge? Let’s suppose your organization finds out that you have indeed a worth pursuing set of aspirations, but that they are quite hard to understand and remember. In this case, your mission, vision and values should be reframed to ensure simplicity, general comprehension and retention. Radical fix warning: What happens if after the challenge your organization realizes that the worth pursuing parameter turned out to be negative? Then, your aspirations should be completely rethought. Regardless the case, widely share the results of this phase and invite the entire community to participate in the discussion. For such, everyone should produce new ideas keeping in mind these three evaluation parameters: catchy, simple and worth pursuing. Furthermore, they should also consider that as they belong to a community, a sense of unity must prevail. In others words, storytellers need to think of their peers during the creation process. Will my community understand this idea? Will they be willing to follow this community purpose? Those can be useful questions in order to write down a simple, engaging and powerful aspiration. Once your community has in their hands a compelling set of aspirations, your storytellers can unleash their inventive and bring new angles in order to complement and bring life to those static words. Resonate by Nancy Duarte: a visual and useful book on what compelling stories have in common. She deconstructs several popular Ted talks and speeches to focus on what makes the arc of these presentations so powerful, and provides several tools you can use in creating your own presentations. The Story Factor by Annette Simmons: a very good book on the power of storytelling in business. What are you going to tell? The possibilities are endless. You can, for example, focus on true stories which demonstrate real applications of company aspirations. It will help you to discover and reward real corporate heroes who help and inspire people inside and outside the community. In addition, you may create fictional but believable stories to reinforce your company’s purpose. While many of the stories can be spawned in text format, writing is nothing but the tip of the iceberg. The Massive Storytelling Sessions need a diverse talent pool to successfully grow. Each individual has unique and useful skills to create and make stories come alive. Are you good at delivering public speeches? Do you have a killer instinct for sales? Are you good at telling jokes? Do you love music and play an instrument? Do you take photos anytime? Are you a mangaka, grammar geek, or avid reader? Chances are, if you are a human being, you will totally fit in the sessions. Hero: a doer or brave leader who lives corporate aspirations and achieve tremendous feats (i.e. Harry Potter, Luke Skywalker, a co-worker or colleague). Anti-hero: a flawed hero who courageously embraces failure and ultimately succeeds (i.e. Snape, Einstein, Steve Jobs, innovators, inventors, misfits, hackers and on). Mentor: an influencer leader who shows the way to the entire organization (i.e. Dumbledore, Yoda, Gary Hamel, corporate bards, organization’s veterans, etc). Ally: a supporter character who empathizes with company aspirations (i.e. Ron, Hermione, Han Solo, Chewbacca, customers, suppliers, society, strategic partners). Enemy*: a layer of bureaucracy or a key barrier that impedes your organization from moving from Management 1.0 – command and control management- to Management 2.0 -the management humans need-. Note: do not put human beings as enemies in your stories; this will backfire to your organization and your shared aspirations. Don’t use stories for evil. *This last idea has been inspired in Don’t Just Flatten the Organization, Make Everyone Accountable for Flattening Time-Sucking Bureaucratic Systems, a great hack written by Chris Grams, Sam Folk-Williams and Rebecca Fernandez. Once a story is ready to go, its authors (seeders) can upload it into the contribution platform in order to be peer-supported and become part of your ecosystem of stories. After you have run the sessions and come up with many compelling stories circling around your contribution platform, you will probably wonder what to do next. The answer is to apply and internalize stories. This will allow your organization to embrace their aspirations so deeply that it will be unnecessary to think about them to overcome obstacles. Hence, aspiration-based decision making will become an effortless and natural process. Your organization will fulfill its destiny just as Harry Potter successfully did, or just as you do when you walk, dance, swim and on. Invite your community not only to create stories, but to tell them every time and everywhere they go as if they were bards. Don’t forget about your tales. Use them wisely to inspire people, spark initiative and inventive, close deals, and surpass roadblocks. Compile all the stories in a publication honoring your community authors and co-authors. You may even call it: “One book, one aspiration, tons of stories.” This could be a nice gift for customers and a splendid way to spread your corporate saga. Highly recognize your storytellers. You may fund, for instance, a professional production of the most promising-peer supported stories (i.e. a short film, a music video clip, a graphic novel, etc.). Alternatively, other stories can be produced as well by the very creators using free Web tools. The possibilities are endless. Let’s Do this Again, but When? This hack is intended to be both a continuous and a periodical process. 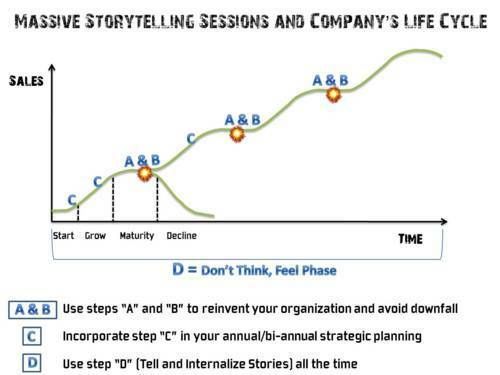 On one hand, step “D” (Tell and Internalize Stories) should be a never ending process. As long as your organization exists, your stories should exist, too. In fact, there is a chance that your saga, and in consequence, your core aspirations will transcend and become a true legend, a must-study benchmark for younger generations. On the other hand, you can incorporate step “C” (Co-create Corporate Saga) in your annual or bi-annual strategic planning. This will be the moment for thinking once again what stories need to be told in order to address current and future challenges. Also, it is the perfect timing for evaluating the performance of your truly aspiration-based community of passion. Last but not least, as soon as you reach the maturity state in your business life cycle, you can use steps “A” (Peer- challenged Aspirations) and “B” (Improved or Co-create New Aspirations) to creatively disrupt your community as never before! Use the experience acquired during the Massive Storytelling Sessions to run further and ambitious open collaboration projects in order to transform and prepare your community for the years to come. This is the quickest and easiest way to test this hack. You do not even require a fancy technology application as the Web contribution platform. As an alternative, you can start with something as simple as a blog. Sometimes less is more. Encourage a small group of volunteers to put their creativity and passion together in order to experiment, raise questions, identify bugs/barriers, run the storytelling sessions, and share their results with everyone. Use physical and/or virtual workplaces. It depends on the number of participants, geographical locations, and other variables. Use a blog to publish stories, share the outcomes of each step with the entire community, and encourage a broader participation and involvement. Once the pilot experiment ends, participants will become your very first cohort of Corporate Bards. They will help you to apply Massive Storytelling Sessions at a larger scale. We also want to thank all our fellow hackers from the MIX Hackathon Pilot. Without them, this hack wouldn’t have been conceived in the first place. Alberto also wants to acknowledge the contribution of Diana Felibert and Arturo Sanchez, who not only listened with interest Alberto’s ideas, but provide him with insightful points of view. Thanks! Finally, a special thanks to Kartik Subbarao who enhanced our hack by suggesting us to change the word "leech" with a more collaborative term. We are using now "peer". An interesting article. Many thanks for your contribution!! Great hack -- and the hacks within the hack give it the richness to let others give it a try. I'd love to see this idea being tested in the field! Stories are excellent ways to share insights and wisdom. I also like the technology platform/social media integration. Change the word "leech" though -- it's unnecessarily discordant. You want to encourage people to use good stories, irrespective of whether they write their own. That's a great suggestion, thanks! We could use the word "peer" instead, as in some bittorrent sites. Excellent choice -- peer fits in perfectly with the collaborative mindset and reinforces a sense of universal respect. Best of luck to you in the MIX contest! Thanks a lot Kartik! With your contribution you have now become a seeder of our MSS! I'll edit the post in order to include you in the credits and acknowledge your improvement! We really appreciate your comment! Thanks for sharing the Zappos experience with us, it is very interesting (By the way, I just asked for a free copy of their Culture Book, can't wait to receive it!) As you wrote it, our hack has some reminiscence with Zappos but with an active/challenging approach. In my opinion, to challenge current corporate strategy is one of the key aspects of our MSS hack, thank you for bring this subject to the table. Please consider suggested questions just as a rough guidance. That was our first approach to create simple, engaging and powerful mission statements. Nevertheless, we are deepening on in the applicability aspects of our hack and your position will be definitively taken into account! Thanks! Please help us to spread the word. Very interesting hack. Very well explained and offers a good application. The idea of "communities of passion" is a great change from what management (and life) has become. We need more passion. We need, as Bruce Lee says, "emotional content". To reinvent management I believe it is essential to develop stories that allow us to relate with the brand and to feel different about it, from an insider and an outsider perspective. I hope we can see it being applicated very soon. I am sure it can make a great difference. Please note that “Solution” and “First Steps” sections have been considerably modified in order to improve both the hack’s illustration and the applicability aspects. •	Let’s Do this Again, but When? On the other hand, the Curator Role specified in our “Design a Web Contribution Platform” subsection (“Solution” section) has been removed. We realized that it may prevent the establishment of collaborative efforts within organizations and the creation of antihero’s (disruptive innovation) stories and actions.